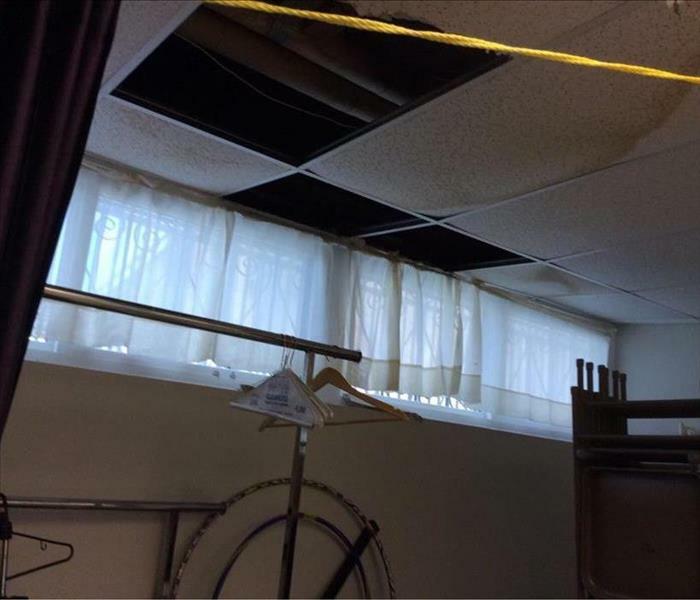 After a pipe burst in the lower level ceiling of Trinity Church in Waukegan, our crew was there to dry out and clean up the water and damage left behind. 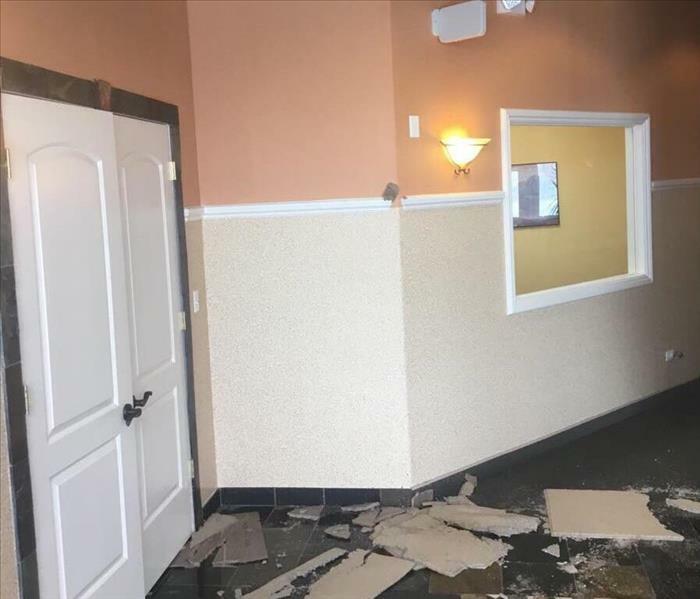 Multiple units in a shopping center in Gurnee had water damage due to a burst pipe in the building. 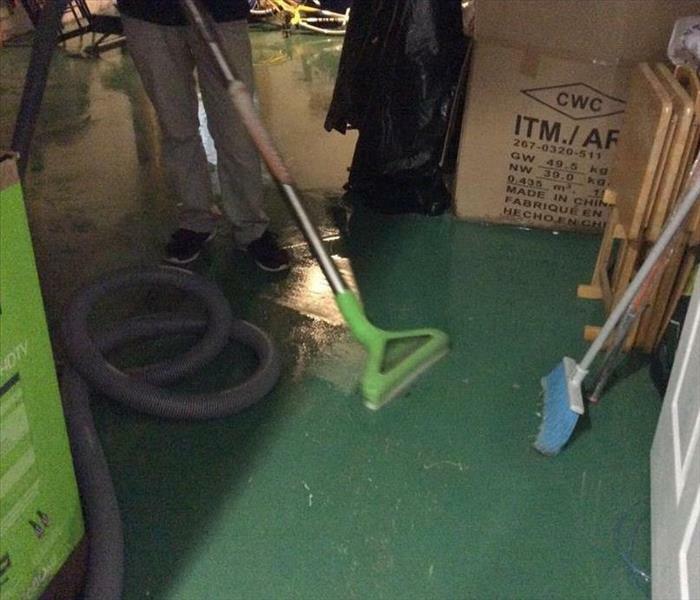 We were able to clean up the water and mess to make sure the business owners could open again. 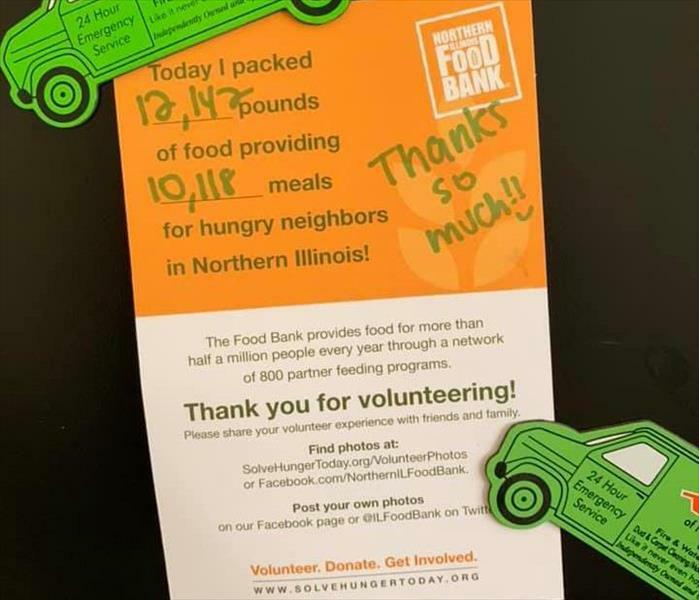 A few members for our crew were happy to donate their time again to the Northern IL Food Bank. We had a great group and were able to package enough food for over 10,000 meals! 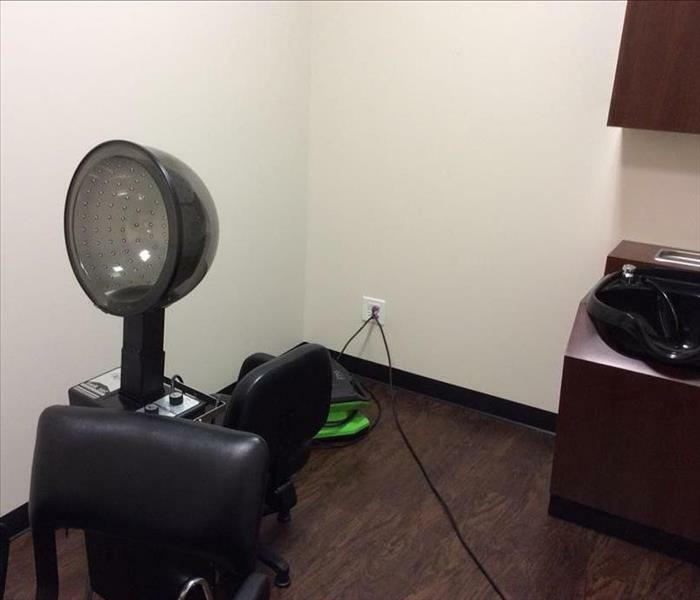 A Salon in Libertyville had a leaky pipe. We stepped in to dry out everything and clean up the water that had spread throughout. Afterward the Salon was back to "Like it never even happened." 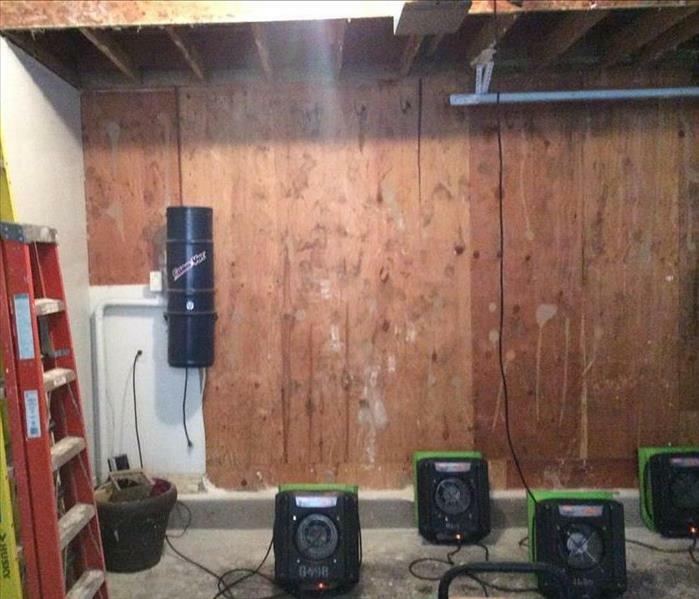 A sump pump back up caused water damage in the basement of this Lake Forest home. 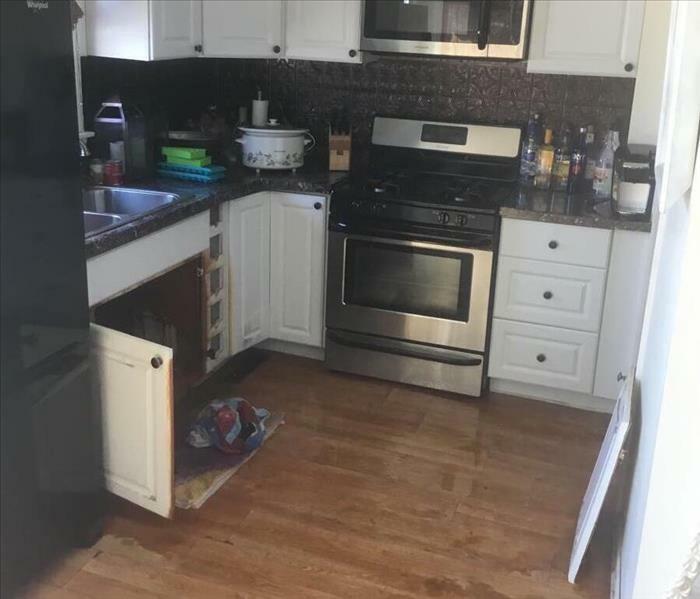 We were able to clean up the water quickly, and make the homeowner happy. The master bedroom of this Libertyville home sits over the garage. 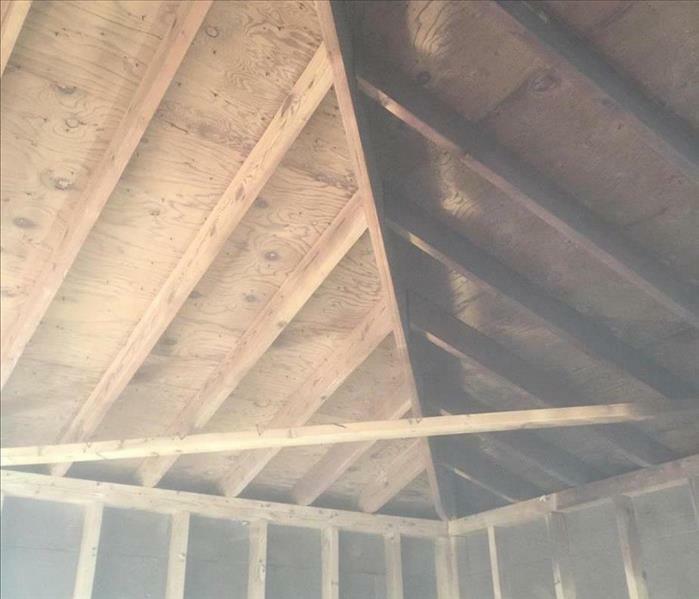 When a pipe burst in the master bath, the water damaged the whole side of the garage wall as well as the ceiling. It all had to be removed and dried out. 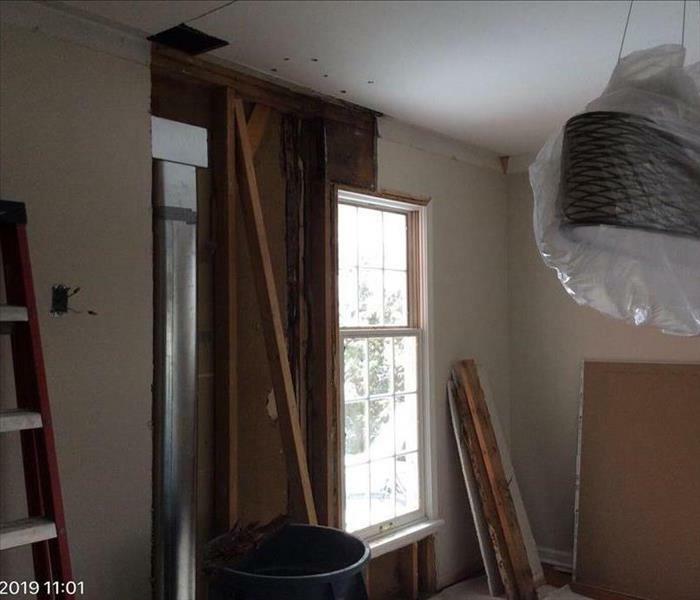 This Libertyville home unfortunately had a flood in the finished basement. 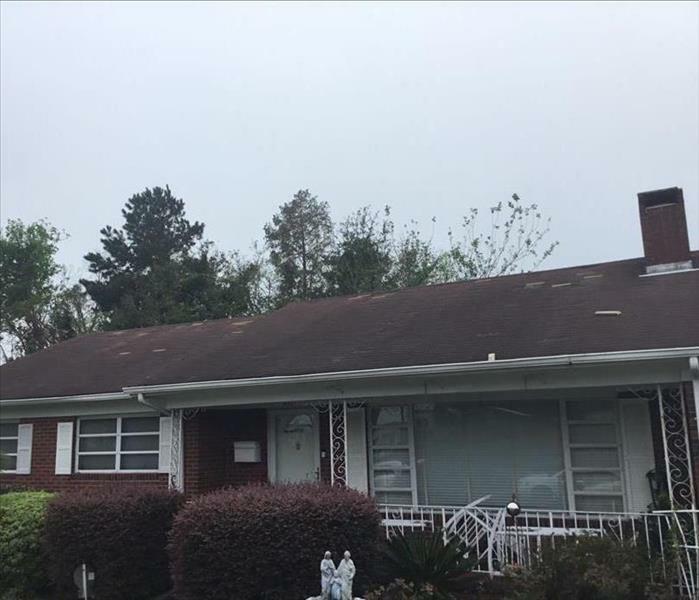 Their was an office, family room and bedroom that were affected. 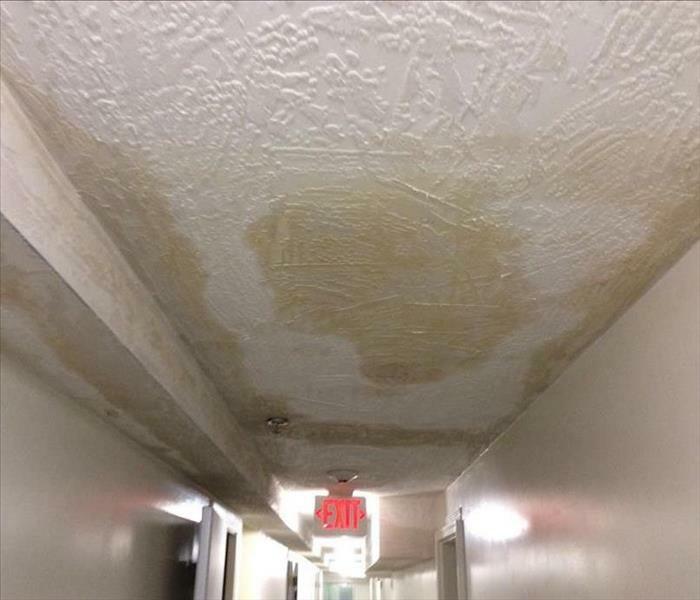 We were able to dry out the carpet and get it back to normal. 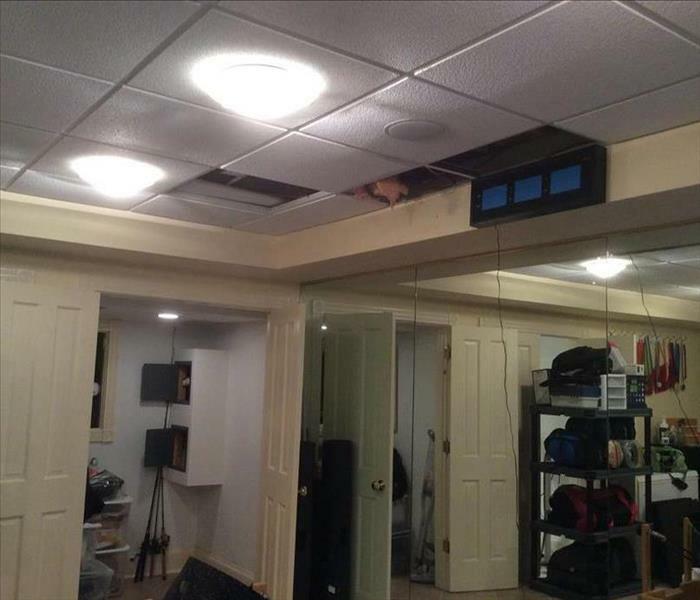 This Lake Bluff homeowner was referred to us after a gutter on the home was sending water inside through the wall. He noticed mold forming and we stepped in to clean and fix the issue. The Polar Vortex caused the Children's Hospital of WI to experience a large scale water loss. 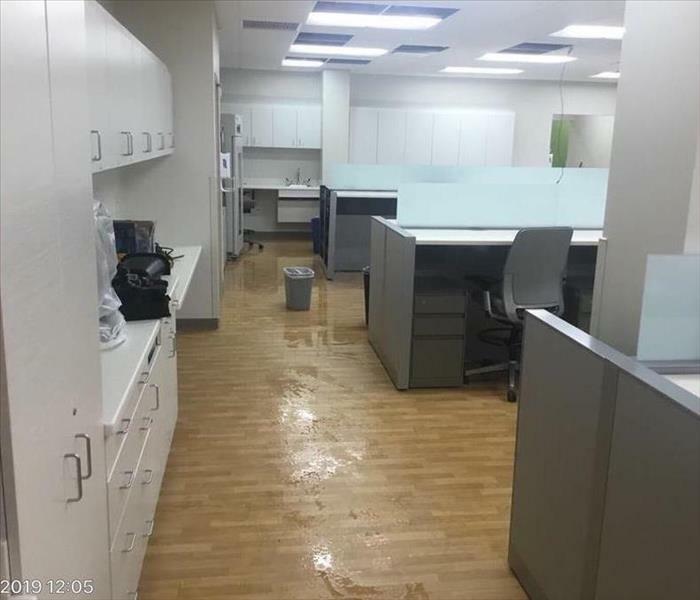 We were happy to assist another SERVPRO in the cleanup and mitigation of this. Our hardworking production crew is here to make sure every job is handled quickly and efficiently. Their training and knowledge is always growing and increasing. They are ready whenever disaster strikes. Smoke and soot damage after a fire cleanup on detailed sentimental items is when our ultrasonic cleaning system shines. 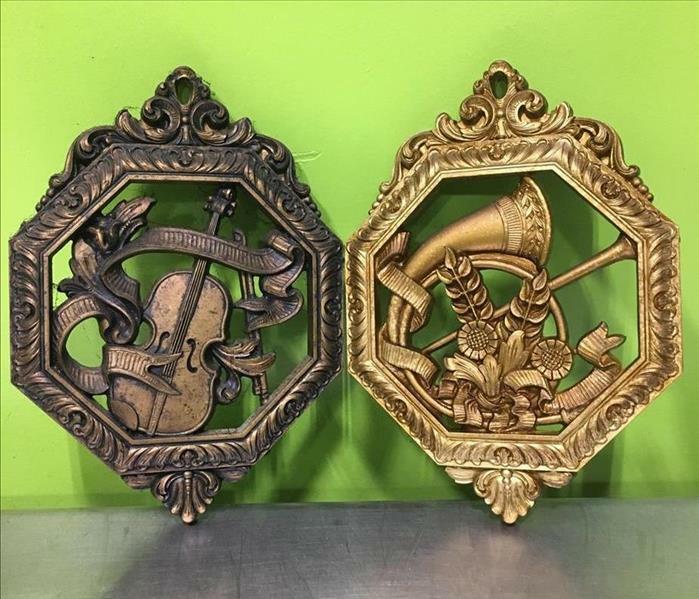 This ornate set came from an electrical fire in Waukegan, IL and our ultrasonic cleaning technician was able to clean and polish this personal belonging making it look brand new again! This photo was taken after our team meeting and includes in the top Row- Josh, Robert, Tom, Ralph, and Cody. The bottom Row includes Victor, Brad, and Ryan. 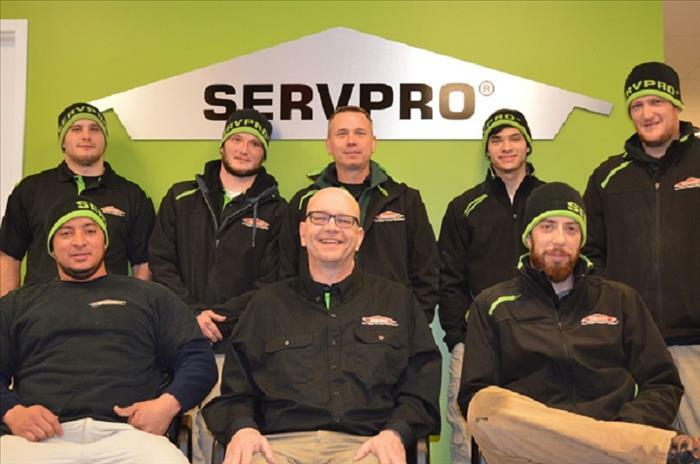 Our technicians have all completed SERVPRO's ECTP training. This means that they have all gone through training, completed exams, and received their certifications in crew, water restoration, fire restoration, and carpet and upholstery cleaning. 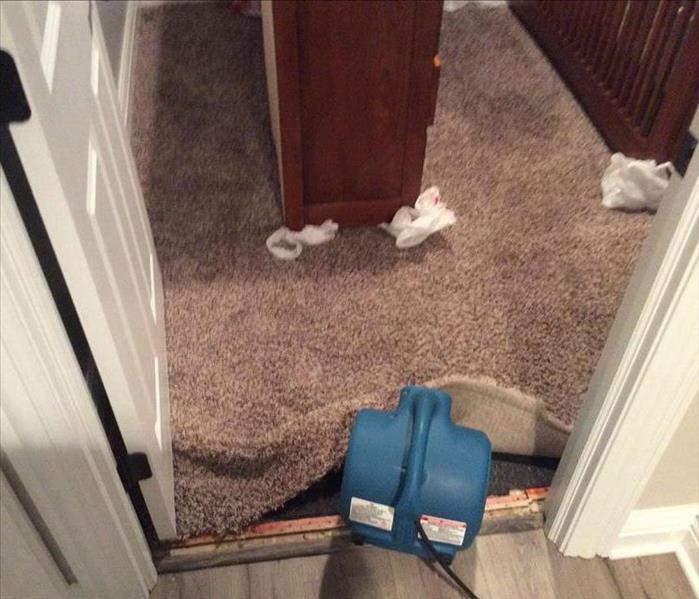 A sprinkler head caused flooding in a Lake Bluff Home. 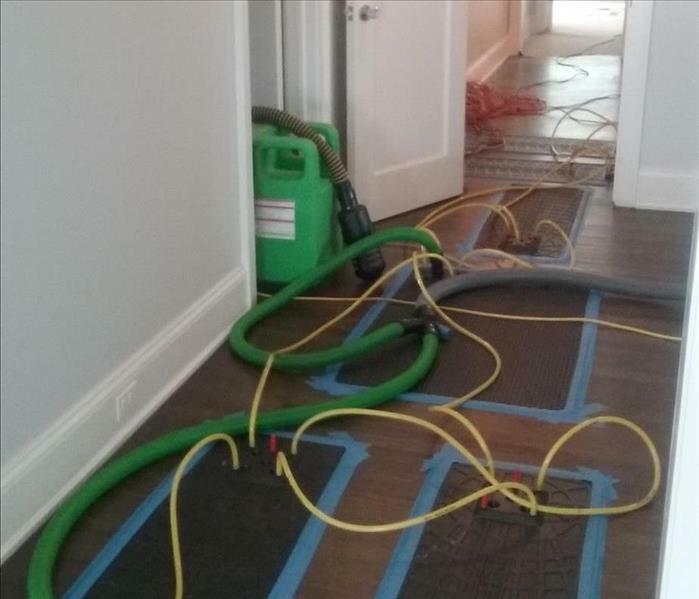 SERVPRO® of Gurnee and SERVPRO® of Libertyville/ N. Chicago City/ Lake Bluff used our Injectidry drying system which can remove hidden moisture from high risk areas such as specialty flooring. That is not a shadow! 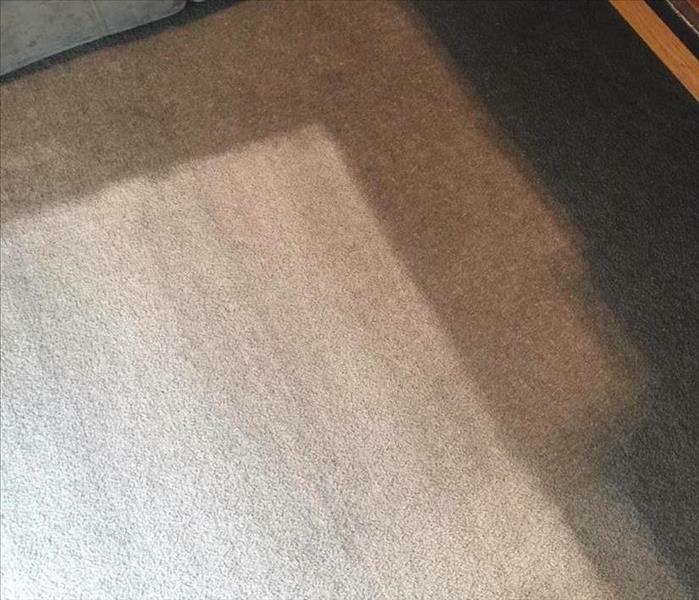 This is an image of a carpet cleaning job that we completed in a Beach Park home. The home experienced extensive soot damage after a fire. Instead of replacing the carpet, our technicians were able to clean the carpets. Smoke from a fire travels everywhere. This photo shows the soot that has made it behind the drywall in a North Chicago home. Our IICRC Fire and Smoke Restoration Technicians removed the dry wall to clean behind the walls with a soda blast technique. 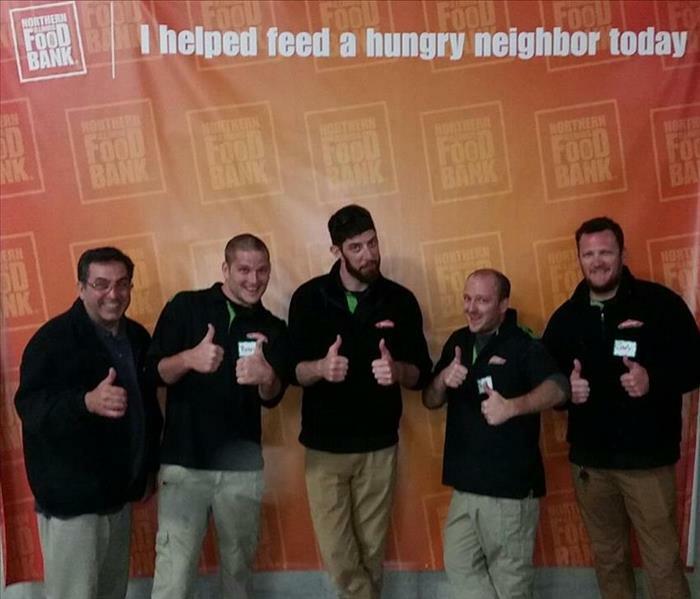 A portion of SERVPRO of Gurnee and SERVPRO of Libertyville/ North Chicago City/ Lake Bluff team had an opportunity to give back by volunteering time to Northern IL Food Bank in Park City. This Vernon Hills home experienced fire damage. 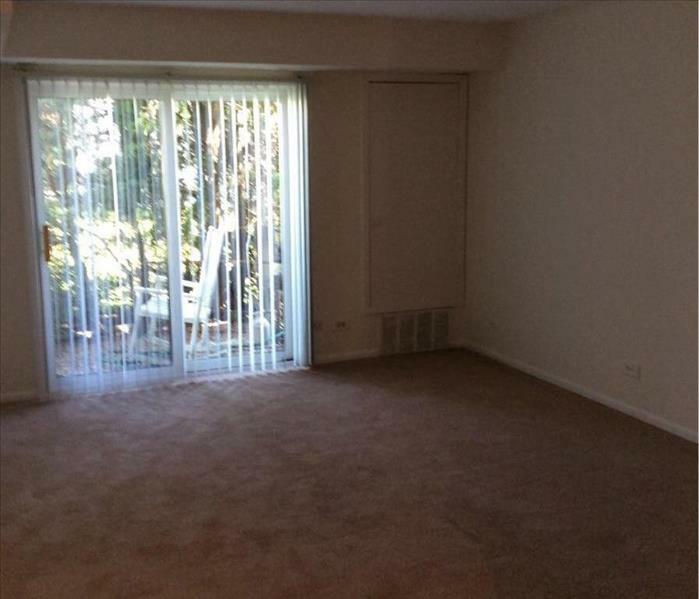 After cleaning up after the fire, SERVPRO of Gurnee & SERVPRO of Libertyville/ N. Chicago City/ Lake Bluff did the reconstruction portion of this living room. 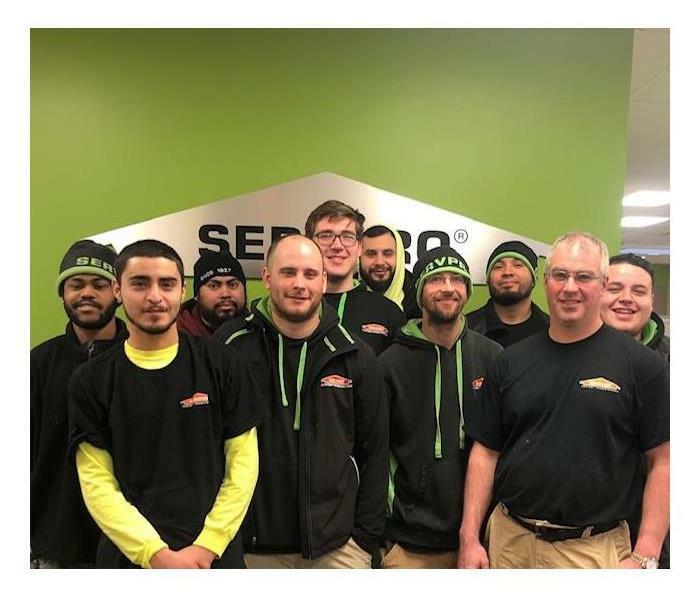 After experiencing a fire, this Vernon Hills resident called SERVPRO of Gurnee & SERVPRO of Libertyville/ N. Chicago City/ Lake Bluff to help clean up the damage. Afterwards we were asked if we could do the reconstruction of their kitchen. 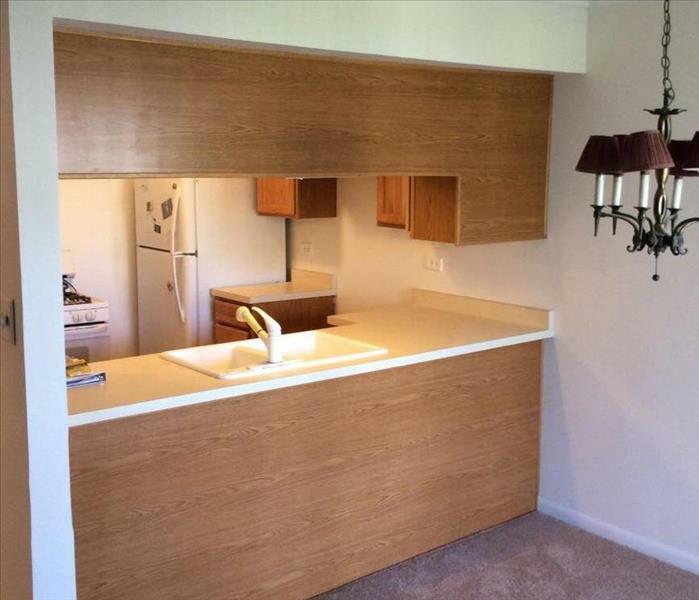 Here is an after photo of the work that was completed.